The other day, I was thinking of enrolling for a crash course in Japanese when my friend, Gina, recommended an app which she said was as good as having a personal tutor. On her advice, I downloaded the Japanese Phrases iPhone app and found it to be a handy application that helps users sharpen their listening, pronunciation, reading and speaking skills. It lets you learn conversational Nihongo (the Japanese lingo) wherever you are – at school, at home, while commuting to office or at the gym. The Japanese Phrases app is more than just a learning resource. It gives users adequate training and practice to pick up a language that is not their own. The app teaches the basics of the language through more than 700 words and phrases that are used in day-to-day conversations. It is a practical app that has the right tools to facilitate easy comprehension and retention. As the phrases are voiced by a native speaker, users learn them with the correct pronunciation. And by repeating the phrases continuously, it becomes easy to memorize them. As all the phrases are displayed as flashcards, learning the language is quick and interactive. The grammar lessons are interesting and I was able to grasp the concepts almost instantly although a little effort was needed. There is also an email option that helps users to mail phrases and I used it to get a few clarifications from Sun, my friend who introduced this app to me in the first place. I like the idea of displaying phrases and words in a random manner as it helps me recall the familiar ones and learn the new ones as well. The study bank helps in saving favourite phrases or ones that you would like to refer to later. The phrases are categorized to make learning easy. Japanese Phrases has also a search tool that helps in looking up phrases both in Japanese and English. This app helps you learn the language at your own pace. You can quiz yourself to find out about the progress you are making, The app eliminated all the apprehension I had about learning a foreign language. It made me feel confident and helped me build my Japanese vocabulary in no time. All said and done, this app will attract only a few people as it caters to a very niche audience. The app is available in the Apple iTunes store and can be downloaded for free. Looks like its very effective. I want to learn it also (Japanese language) since one of my relative lives on Tokyo, and she’s planning to go home in our country. Too bad I don’t have any iPod, by any chance it is available on Android Market? I looked for the app in the android market but did not find it. But there are other apps that might interest you. Make sure to check it out. I have tried teaching Korean students and they said that Japanese is somehow easy to learn.. Interesting that there is an app like this! I too was surprised to hear about it in the first place, but the app has been interesting. I’m not sure if I could learn a whole new language through an app. And not just any language, its Japanese. Still a helpful resource though ! 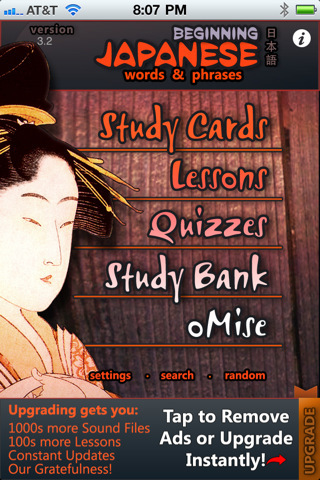 Really great app, You can learn japanese without spending any money…. Are there some other apps which teaches you other languages as well? This way you can learn without paying to any professional teacher and coaching. This apps assists learning the basics and can’t replace a real-life tutor. You stille need to attend classes or language workshops to master. I really want this app. Didn’t even know I could get something like this. I’d love to learn another language-especially Japanese. Off I go to download it. Thanks for sharing this,Ron. Good luck Rochelle, do let us know how you get on! I’m not learning Japanese but my little brother loves Japanese very much. He’s studying it himself. I think this little tool can be a huge boost to him. Thanks for the great recommendation! Goodluck to him & hope he finds it useful. I still doubt that it is possible to learn Japanese using the app. I think you need a teacher and going to some courses as you need some guidance while learning such a difficult language. As I said, the app helps you cover the basics and thats it. A native language tutor, in this case Japenese, will do a far better job than an app and that can’t be undermined at all. This is a great app. I wonder if they do offer the same app for other languages. Things that people come up with nowadays in apps are just amazing. Can’t imagine the things that are going to be available to us 20 years from now. Now that’s really exciting. nice application.. I have iphone4 but to be very frank i don’t find much time to explore many applications but I have used this application when I have to make an official proposal and for that I need to include some Japanese words in that proposal, at that time I took the help of this application. Sometimes these apps helps a lot. This is a great app. I hope it would come out in other languages too. Would be amazingly useful. No doubt if Ron finds one he will mention it! Nice application! I used to study Japanese language before using my Nihongo dictionary before. I’ve learned only the simple words like Akachan. I haven’t actually reached the conjugation part so I wasn’t able to master the sentence creation. I’m pretty sure that this will be helpful for me especially that having an app is more convenient compared to a booklet. I started learning Japanese using my booklet. This is a sort of dictionary that translate English words to Japanese words. I am glad that I could learn more about the language using my iPhone. I will try this one out!